KUALA LUMPUR (Feb 13): Plantation companies are expected to post weak results for the fourth quarter financial year 2014 (4QFY14) due to lower output, poor refining margin and large unrealised foreign exchange (forex) losses. Maybank Investment Bank Bhd analyst Ong Chee Ting said in a clients' note today that companies likely to report weaker-than-expected 4QFY14 results include IOI Corporation Bhd due to huge unrealized forex translation losses. Similar lower expectation also apply to Felda Global Ventures Holdings Bhd (FGVH) due to flood related expenses after devastating floods hit the East Coast of Peninsular Malaysia where most of FGVH plantations are located. 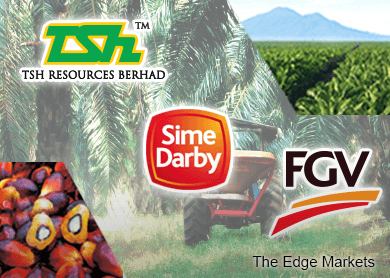 Ong expects Sime Darby Bhd and TH Plantations Bhd to be affected by weak fresh fruit bunches (FFB), and Kuala Lumpur Kepong Bhd by weak downstream contribution. “IOI Corporation is likely to announce its first quarterly loss in over a decade, we estimate,” the note read. Ong said unlike in 2013 when fresh fruit bunches (FFB) output peaked in the fourth quarter, Malaysia’s FFB output for 2014 peaked in the third quarter of financial year 2014. Going by geography, only Sabah’s production bucked the trend where FFB output peaked in 4Q14, he added. Ong notes that most of the Malaysian plantation companies under the research firm’s coverage registered lower quarter-on-quarter (q-o-q) production in 4Q14 with the exception of IOI Corporation and Genting Plantations. “We observe that the industry’s FFB output has slowed quite considerably q-o-q in 4QFY14,” said Ong. “This reinforces our view that FFB output supply growth will be weak for the nine months of 2015 (9M15). “We believe there could possibly be downward revision to plantation companies’ growth guidance for 2015 at the upcoming analyst briefings,” he said. Ong also said that the 4QFY14 refining margins were expected to be weaker q-o-q with potential negative refining margins, largely due to zero crude palm oil (CPO) export duty in both Malaysia and Indonesia as well as over-capacity in the region. However, Ong noted that oleo-chemical players’ results would be mixed, depending on their hedging strategies amidst volatile feedstock costs and falling crude mineral oil prices. He said that IOI Corporation would be the most affected by huge unrealized forex translations loss, but less so for Genting Plantations, TSH Resources Bhd and Sime Darby.